The resource curse theory has used to provide some explanation for the poor economic performance often seen in oil and mineral countries. It suggests that dependence on natural commodities exploitation is has an overall negative effect on economic growth. Small states however are encouraged to embrace tourism, which for SIDS in particular is based on taking advantage of their natural resources. 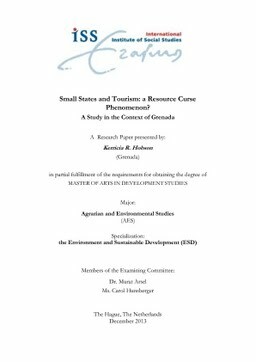 Applying the resource curse theory to small tourism-dependent states have suggested that the specialization in tourism can lead to curse outcomes and suggests a need to either re-evaluate the benefits of tourism dependence in small states or acknowledge the merit in calls for the special and differential treatment of small states.